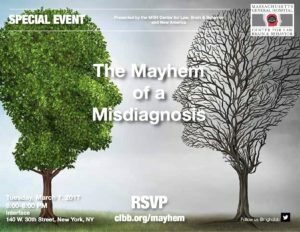 In this event, the Center for Law, Brain & Behavior will present a case that concerns a tragic trajectory caused by undetected brain disease and the interpersonal and larger societal havoc that can be wreaked by a misdiagnosis. Weaving a narrative that highlights the subject’s personal life and neurological decline, experts in psychiatry, law, and neurology will consider: what can be done to prevent the mayhem of a misdiagnosis? This event will be held on Tuesday, March 7, 2017, at Interface (140 W. 30th Street, New York, NY), from 6:00-8:00 pm. Make sure to RSVP before the event! This event is co-sponsored by New America and the MGH Center for Law, Brain & Behavior. Watch video of the entire event below!